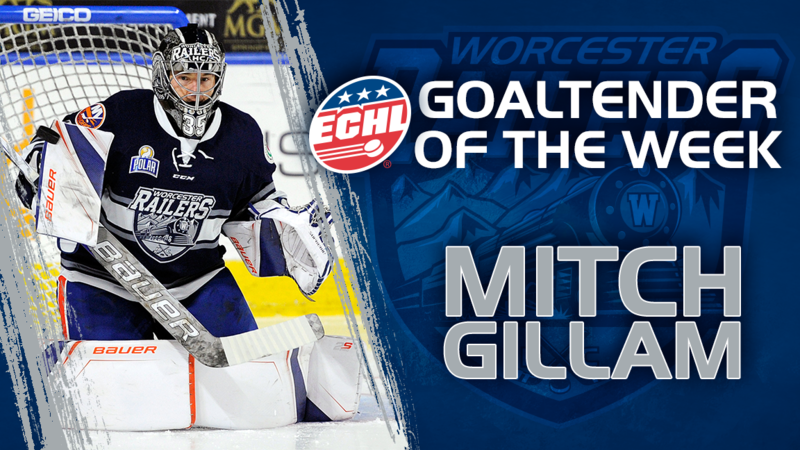 Worcester, MA– The Worcester Railers Hockey Club (@RailersHC), proud ECHL (@ECHL) affiliate of the New York Islanders (@NYIslanders) along with the ECHL has announced today that Railers’ goaltender Mitch Gillam (@gillyg00se32) has been named the CCM ECHL Goaltender of the Week for the week of Nov. 26-Dec. 2. It is the second time in his career that he has received the weekly honor. The 26-year-old made 37 saves in a 2-1 win at Brampton on Tuesday, stopped 30 shots in a 4-2 victory at Maine on Friday and had 31 saves in a 3-2 win over the Mariners on Sunday. Under contract with Bridgeport of the American Hockey League, Gillam is 5-6-2 in 11 appearances with the Railers this season and is tied for fifth in the ECHL with a .925 save percentage and ranks 15th with a 2.55 goals-against average. A native of Peterborough, Ontario Gillam has appeared in 54 career ECHL games with Worcester and Orlando posting an overall record of 28-21-3 with five shutouts, a 2.39 goals-against average and a .920 save percentage, and last season, he earned a spot on the ECHL All-Rookie Team. The Railers host the Brampton Beast on Wednesday, Dec 5 at 7pm – score $5 any ticket at the Box Office with your Price Chopper / Market 32 Advantage Card. On Friday, Dec 7 the Railers host the Beast at 7pm on a 2-3-4 Friday! Boston Bruins forward Ryan Donato will sign autographs from 6-7:30pm presented by Raymond James Restoration.